And then the search begins, without knowing what is in store. It goes without saying that a career in Law Enforcement is dangerous. Law Enforcement agencies strive to keep their SWAT teams and Patrol Officers safe by equipping them with the most specialized gear available and providing the best training possible. But, as we see in every industry, just what constitutes the “best of the best” evolves as new, intuitive products emerge on the market. For Law Enforcement, the traditional tactical flashlight has served its purpose for years, but Officers have encountered crippling limitations with the “cone-shaped” lighting offered by traditional flashlights. In a dark room, abandoned building, basement, or outdoor area, the lighting of a tactical flashlight limits the user to seeing only one “slice of the pie” from where he or she is standing. If we once again use the pie analogy, it is easy to imagine how danger can be lurking close by – yet just outside one’s field of vision. A suspect seeing the light from a tactical flashlight can easily identify the position of the Officer holding the light. After years on the job, a Police Officer decided it was time for a solution to these drawbacks. 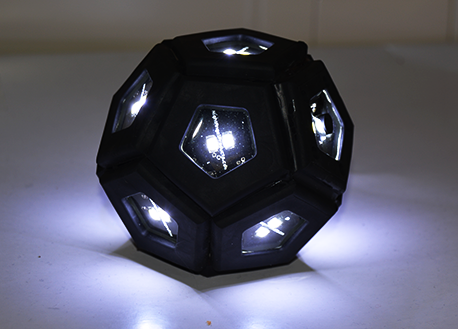 Created by cops, for cops, Light Grenade is a 360-degree tactical light that is thrown toward a target area and then deployed with a remote key fob to illuminate the entire surrounding area, detect movements and shadows, and keep the suspect unaware of the Officer’s position. Using Light Grenade, Law Enforcement Officers can literally “blow up a room with light” and quickly recognize threats. Light Grenade is the size of a baseball, making it easy to carry and use. Although this tool is the size of a baseball, it does not roll. It has 12 sides, which ensure that it lands and sticks where the user intends. Light output of 1500 lumen in all directions. This product is virtually indestructible – watch a video. LED models and Infrared models with night vision goggles are also available. Click to learn more about the Light Grenade or Request a T&E Unit.